I saw the email in my browser and winced. Correspondence from literary agents had taken on a different tone and tenor since the incident—in my head I’d come to calling it 'The Unpleasantness'—and my nerves were still a little raw. Fingers crossed. I’m ready. I took a deep breath and clicked the link. The memories of The Unpleasantness were fresh because they were only a few weeks ago. I’d finished my manuscript, then edited it. I spent three months, every day, editing, writing, polishing and improving. I started in January and finished in June. This was my third novel, and I felt like it was time to start querying. I joined one of those websites that help you improve your query letter. I researched agents to see whom would be the most likely to take on my project. I planned, plotted and circled the calendar day when I would put these plans into motion. Query day came. I took my sharp query, attached it to my polished manuscript pages and sent them to my well-researched agents. I exhaled. I went back to my couch and thumbed through Twitter. I noticed one of the agents I queried sent out a few Tweets. My eyes didn’t register his words at first, but the fog lifted: he was trashing my query on Twitter. He didn’t just trash my query, he held it up as an example of cliche garbage he receives on an hourly basis. He wished, on Twitter, that a good writer would someday “blow his mind.” I was crushed. Rejections are hard, but being held up for ridicule in a series of Tweets is devastating. Six months of writing rendered abrogate in seconds. The form rejections that trickled in after that were razor grains of salt in a gaping wound. The thought entered my head: this is pointless. I’m the kind of writer that makes agents hate their job. I’ve always had thick skin in the past, but since The Unpleasantness, I’ve been a sunburn. I clicked it, prepared for the worst. The latest email came in. Here goes. I took a deep breath and clicked the link. It was a long email. I saw my name. My jaw dropped. It was another rejection, but it was the best thing I’d ever seen. “[Your first chapter] is really strong. You can really feel [the main character’s] pain and understand where she’s coming from, but you lose me in the second chapter. It just feels a little false. I’m going to pass.” It was like a Christmas morning. She was passing, but I had a place to start. The first chapter isn’t awful. I looked at the second chapter. They were right. I typed out an enthusiastic thank you and got to work immediately. In the months that passed, I’ve been rewriting. The book is much better. I’m hoping that I can start querying again soon. Rejection is painful. Ridicule can be fatal. Both of them are oxygen for the flames of burning doubt that already exist in your mind. Someone is confirming your deepest held fears: you’re no darn good at this. 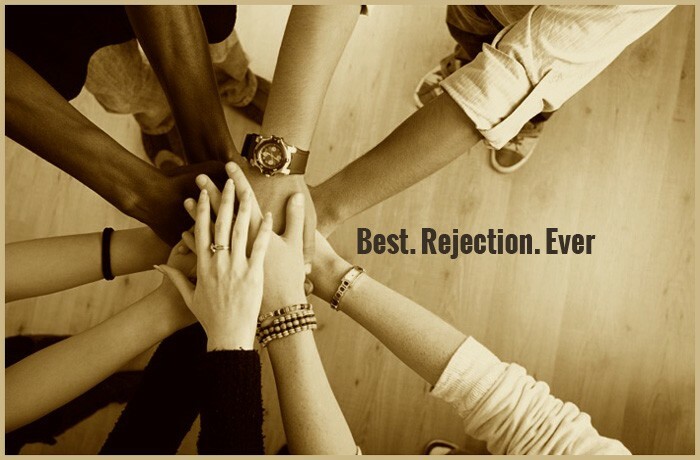 This experience has taught me that there is only one way to salve the deep wounds created by rejection: more feedback. Even if it’s just a lighter slap of rejection, it’s a step in the right direction. When the waves hit, you’ve got to keep your knees strong because the claps of awful rejection can rock you, but they can help. You’ll be stronger. Your work might be stronger, and it might help you in your steps toward those elusive and magical partials and fulls. My wounds dried into scars. I’m ready for whatever happens, and far more prepared than I ever was before. I know I can handle it, because I’ve experienced the worst case scenario. Fingers crossed. I’m ready.